Heaven is Paved With Oreos by Catherine Gilbert Murdock. Houghton Mifflin Harcourt, 2013. Currently available. Face Value: Cover tropes collide: a headless girl, Converse sneakers, and oh of course something with cow print because it’s set in Wisconsin. The map background is about the only thing saving this book cover. At least the cover model at least looks to be the same age as the girl in the story, and dressed in a way that is believable for Sarah as a character. Does it break the slate? Yes! It’s especially wonderful because this book features two kinds of Slatebreaking characters. Z (Sarah’s grandma) is a1960s era feminist who has grown into a senior citizen community activist. Sarah is soft spoken, inquisitive, and a blossoming intellectual. She breaks the slate by constantly asking questions, and she’s learning how to cope when she gets answers that aren’t satisfactory. Who would we give it to? Sarah is a smart girl who examines the world with a scientific mind. Girls who look forward to the science fair every year will love Sarah’s story. It’s also a great story about a first time major travel experience and would be a nice book to share with young readers about to embark on their first major trip. Review: Catherine Gilbert Murdock’s Dairy Queen series is among my favorites in realistic YA fiction. Set in the rural town of Red Bend, Wisconsin, the series tells the story of girl athlete D.J. Schwenk as she breaks gender barriers in sports and broadens her perspective on romance, relationships, and gender roles. 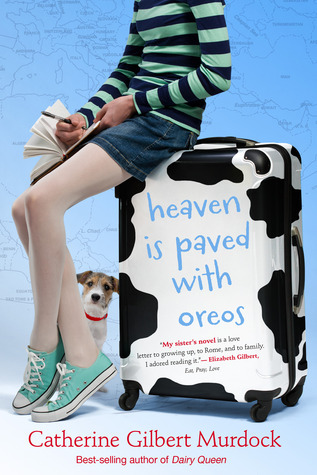 Murdock’s new book, Heaven is Paved With Oreos, returns to Red Bend to tell the story of another Slatebreaking girl growing up in the town. Her name is Sarah Zorn. Does the name sound familiar? It should, because we originally met Sarah in the Dairy Queen series when she started dating D.J.’s younger brother Curtis. In those books we heard D.J.’s perspective, and now we get to read about life in Red Bend from Sarah’s point of view. Murdock has developed a terrific new character for this book. Sarah’s voice is distinctly different than D.J.’s, and it helped me see Red Bend in a new way. Sarah and Curtis are best friends. Their friendship formed over a common interest in science and exploring the “whys” and “hows” of the natural world. Of course, a boy-girl friendship in middle school draws a lot of ridicule. After being mocked incessantly for hanging out so often, Sarah and Curtis decide to become fake boyfriend and girlfriend. They’re not actually dating, but they say they are. They have found that this keeps people from prying into their relationship. It’s starting to get complicated, though, because Sarah isn’t sure that she wants a fake boyfriend anymore. She might want a real one. But that would be hard. Instead of communicating their romantic interests, Sarah and Curtis let the awkwardness grow and their friendship falls apart. Since things are not going well with Curtis, Sarah is excited for the opportunity to take a trip to Rome with her grandma Z. I loved how Murdock wrote about this adventure through Sarah’s eyes. She’s a girl from a small town who has never had this kind of life experience before. Of course it’s exciting, but it is also terrifying. Sarah worries about all kinds of little things that might make her trip difficult. Her anxiety is spot-on, and I felt for Sarah because the worry was so realistic. One of the most Slatebreaking points of this book is when Sarah has to help Z out of a major emotional episode in Rome. Z becomes despondent when something she dreamed of doesn’t happen the way she imagined, and Sarah has to pick up the pieces. Murdock writes this plot development with grace. Z is experiencing natural disappointment, and she is not made to look silly for feeling down. I appreciated that Z could have a moment of emotional weakness without losing her characterization as a strong woman. And although Sarah could have freaked out and called home, she shows herself to be more capable than even she can believe. Sarah’s experiences in Rome fortify her to face some of the messy stuff she has to deal with at home. She returns to Wisconsin the same girl, but more emotionally mature. Heaven is Paved With Oreos is a strong story about how travel and new experiences can help us grow. This entry was posted in Middle Grade, Reviews, Uncategorized and tagged D.J. Schwenk, Dairy Queen, grandparents, Italy, Rome, travel, Wisconsin. Bookmark the permalink.